After seeing “Leaving Neverland,” I find that I am mourning. I think of lot of us are–as Wade Robson and James Safechuck must have been all these years, as Jackson himself may have also been. And some of that reaction is, in part, a result of the documentary itself, as much as it is the alleged crimes. The four-hour, two-part documentary, “Leaving Neverland,” directed by Dan Reed, contains detailed interviews with Robson and Safechuck–middle-aged men today who, when they were boys, worked with mega-talented pop superstar, Michael Jackson, the “King of Pop.” Robson was five when he met Jackson, then 28 at the time, and Safechuck was nine. It was 1987. An insomniac, Jackson died at age 50 in 2009, close to bankruptcy, and on drugs that may have caused his cardiac arrest. According to the documentary, now on HBO, before meeting Jackson, both boys had creative and artistic interests. Robson won a dance contest whose prize was meeting Jackson, and Safechuck met the superstar on the set of a Pepsi commercial. The boys and their families and Jackson got along. Jackson gave them phone calls, faxes, fond nicknames, gifts, hotel stays, travel, and houses. Robson and Safechuck talk with care and specificity about feelings of love, affection, and friendship with Jackson. Safechuck exchanged marriage vows with Jackson. Both he and Robson talk about being repeatedly violated sexually by Jackson during the late 1980s and through the early 1990s.While it’s true that all films persuade through imagery, audio, and editing, documentaries ideally show various perspectives, with a goal to show the truth. A variety of perspectives is crucial with allegations of crimes in documentaries. It feels as though “Leaving Neverland,” like a predator, both grooms and assaults viewers. The film often cuts to imagery of Jackson looking either demonic or unattractive when the sexual assault is detailed, and also to pictures of Jackson in bed. The live footage of him dancing with the young boys (onstage at a concert, and in a promo spot) are shown more than once, to different effect, because of what’s said in the voice-over audio. This works to persuade viewers of subtext or hidden meanings, and the overall argument of the documentary, creating self-doubt in the viewer and the feeling that your own perception cannot be trusted. The same image looks different when different words describe it. There is some precise detail that describes sexual acts over particular photos. Also, the structure of the documentary, or how the images are placed, move viewers along as though the film is truly documenting events as they happened so that the viewer is forced to take on a perspective. The mothers of Robson and Safechuck seem to have more say than their fathers – then, with the choices they made about where their sons spent the night, and now, in the documentary’s actual interviews, in a film that paraphrases Jackson as saying that women are evil. Michael Jackson, Wade Robson (1987). Photo courtesy of Dan Reed/HBO. Archival footage of Jackson’s own testimony of where his body was photographed when he was on trial feels predatory. I wonder if we should know such precise details when the subject is about sexual violation. 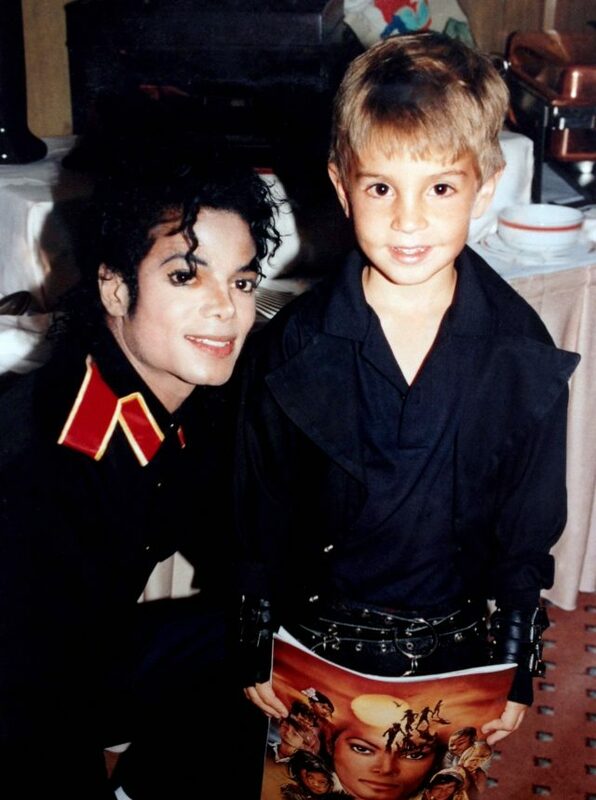 What I think I now know about Jackson haunts me, and I wish I had not seen “Leaving Neverland.” It’s almost like finding out the worst things I’ve ever found out about my own family–the most tragic things–that have changed the way I forever view my past, and my family. But, then again, maybe I’m glad I know. It makes me question my own tendencies to live in denial, ignore warning signs, or believe what I want to believe. 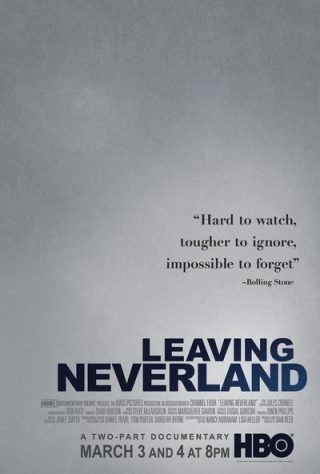 “Leaving Neverland” disturbs me in a way that the earlier trials didn’t. Jackson was accused in 1993 and again in 2003 of molesting other young boys, one of whom had cancer. News coverage in the 1990s and 2000s seemed so distant. Settlements were out of court and allegations dismissed. The “Leaving Neverland” documentary feels intimate, and a lot of that has to do with the sexually explicit language and the structuring of narrative through images, interviews, and audio. Famous people affect us because we share in their artistry, as a community, and individually, privately, as though in communion with the artist. Friendships can be born from sharing the love of an artist’s work. Strength and even self-esteem can be found by experiencing an artist’s creative work, and our yearning for expression and connection is universal and personal. We are a culture of yearning. And now I see we are a culture of mourning. This entry was posted in Miscellanious, Movies and tagged #metoo, Dan Reed, documentary, HBO, HBO Films, James Safechuck, Leaving Neverland, Michael Jackson, Wade Robson. Bookmark the permalink. I watched the first half. Was mortified about how much i misinterpreted the news at the time of the trials. Now i cannot separate MJ ‘s genious from the abuse. Thanks for better explaining Lucretia!